It is a great pleasure to bring you an interview with Shay, aka Kassia. Shay’s music is simply magical and in many of her entrees I have found amazing depth and clarity of emotion. I had the honor to collaborate with Shay on one piece and it was a wonderful experience. Kassia’s artist page can be found here. coffee industry for many years, even though I can’t stand the stuff. I love being out in Nature – camping, hiking, and biking. I am a Capricorn and my favorite color is Blue. I’ve been playing keyboards since I was tall enough to reach them. When I was very young, we had a small electric organ in the house for some reason. Nobody knew how to play it, but my mom bought this colored sticker kit to put on the keys, and I would play by matching the colors of the stickers to the color of the notes in the book (which, um, sometimes produced interesting results since I’m colorblind!). Finally we all got tired of the sound of the organ (or maybe it ﬁnally died), so when I was 9 we went for an outing to the music store and I discovered heaven on earth! Pianos of every shape and size. What was this fascinating thing? And listen to the sounds I can make it produce! So we ended up with a pretty Wurlitzer upright and I started piano lessons. I was immediately hooked and quickly surpassed my piano teacher in skill. I studied piano with several different teachers from the age of 9 through college, but really never embraced playing the classics. I felt very limited by the tempo and theory and forms and structure. I wanted music that I could play with emotion! My teachers would cringe when I brought in the New Age piano books I bought – THIS is what I want to play! So I spent most of my practice time learning to play the New Age music that I listened to, and writing my own stuff. When I was eleven I began playing the French Horn and played in concert bands, marching bands, orchestras and small ensembles all the way through college. Nothing will ever be cooler than the polyester and wool uniforms I had to wear to stand in the middle of a football ﬁeld in below freezing temperatures, trying to get sound out of my brass instrument (while also keeping it from freezing to my lips) and simultaneously marching through snow ﬂurries in order to complete whatever cheesy formation my marching band director had conceived of during some late night drinking session at the strip bar on Main Street. I sang in various choirs from 6th grade through the end of high school, but I was always much more valuable to the choir as a “good ear” and accompanist than as a pretty voice, so I gave that up many years ago. I chose not to study music in college – mainly because I was told I needed to get a degree in something that would actually, um, be lucrative. But I did take a few music classes and lessons while I was there. A few years later, I was fortunate enough to get a job at a University and was able to take composition and theory classes for free. I mostly ﬁnished a second Bachelors degree in Music Composition before having to leave school to attend to some family issues. Anyway, a long story to say basically that I have studied music for many, many years and have learned lots and lots of theory and all that fun stuff, but I really don’t remember most of it, or consciously use it in my composing for the most part. I’ve lost much of my technique due to lack of playing and practicing, but am working on getting that back. I’ve also spent the last few years trying to redevelop my “play by ear” skills which were kind of forced out of me during all the schooling and training. I have excellent music reading and sight reading abilities, but have to work really hard to play something I have only heard and not seen. Hopefully I can regain some of this ability. LOL….um….motivation, no. My parents and teachers would have LOVED that! Actually, I was horrible at sitting down to practice. Very rarely did it. I was, um, a bookworm and spent the majority of my childhood curled up with any book I could ﬁnd. In high school I was so involved in drama and sports and all kinds of activities, that I was rarely home long enough to do anything but eat and sleep. I really was NOT a very dedicated musician. I had enough natural talent to keep me going until college, where the expectations were a little higher and I ﬁnally had to own up to the fact that I either needed to practice or quit lessons. Oh, I would sit down and play the piano, but that was just me making stuff up. I certainly wasn’t practicing the stuff I was SUPPOSED to be practicing. It wasn’t until my early 20’s that I started developing some actual self-discipline and really applied myself to music and composing. Well, everything starts on the piano, which, at this moment, is a $250 piece of crap that is almost a whole step out of tune! Once I’ve tortured myself long enough improvising on the upright, I move over to the electric piano, plug into Garageband, and start recording. So pretty much every song starts as a simple piano improv, which then gets ripped apart, turned around, tooted and toasted and tipped upside down. I add a few things, make a few changes and then put it on my iPod and listen to it non-stop for an hour or a day. Come back, add, subtract, cut and paste. Do it all over again until I can’t stand the song anymore. That’s when it’s ready to post! I will occasionally challenge myself to do things differently, such as start with a theoretical concept and compose from there, but for the most part I start on the piano and then just goof around in GB until I’ve got something that sounds good to me. The unfortunate part about my process is that since most of my songs start as piano improvs, once they are recorded in GB, I really don’t spend any more time on the piano playing them. So, right now there are very few of my pieces I could actually PLAY live. I have a goal to actually transcribe all of my pieces someday so that I can learn how to play them again! You say your upright is almost a full step out of tune. Can it be tuned? Why do you leave it in such a state? Have I mentioned that I’m a procrastinator? LOL…I have no idea if it can be tuned or not. I doubt that it can be, but I haven’t gotten around to calling the tuner yet to have him come up here and tell me for sure. Do you have perfect pitch? I ask because you mentioned “torture” with your upright piano. Do you ﬁnd the instruments in GarageBand are pitched ok? I don’t have perfect pitch. I guess I would say that I have “relative pitch”. To be honest I’m quite happy with just that. Perfect pitch is more of a curse than a blessing – or so I’ve been told. In my opinion, GB does a pretty good job with pitch. There are occasionally notes that will make me wince, but if I mess with compression and EQ I can usually get those taken care of. Or I just switch instruments. You mentioned that you have to work hard to play something you’ve heard. Do you feel that all of your music reading training sort of gets in the way of simply playing from the head or the heart? Well, I’ve worked very hard to get back to a place where I can be comfortable sitting down at a piano and just playing from the heart. But that’s improvisation – very different from being able to reproduce something I’ve heard someone else play. My biggest problem is that I have come to rely so heavily on having music in front of me. I am a much more conﬁdent player – even of my own stuff – if I have sheet music to look at. I am very distrustful of my own memory and ability to play by ear, so if I don’t have music in front of me I’m in trouble…lol…at that point I just start making stuff up. I ﬁnd, also, that I have difﬁculty in composing. Sometimes I get too caught up in notation and having to SEE the chord laid out in front of me, rather than just listening and letting my ear do the work. But all of this is not necessarily directly related to having been classically trained for so many years. I think a lot of it is just how my musical brain works. One of the best parts of MacJams, for me, is meeting so many musicians, working with them on collabs, getting tips and tricks from them, and exploring how each musical brain is so very fascinatingly unique. Garageband 4 with all the jampacks and a few other instrument plug-ins. This area is deﬁnitely my weak point right now. I’m studying and learning daily, but really have so much yet to learn about mixing and mastering. I do almost everything through headphones – with an occasional listen on the stereo or in the car to get an idea of what things are sounding like. And mostly, I’m just listening for muddiness – trying to get as clean and crisp sounds as I can, but, um…I really don’t know what to DO about muddiness except complain about the muddiness so I’m working on learning how to FIX muddiness. I have no idea. They change daily. Composing for shorts, documentaries and independent ﬁlms sounds really cool and might ﬁt my style and talents pretty well. I’ve also been really interested lately in exploring how to use music as a healing source – areas like music therapy, meditation and relaxation, sound and rhythm healing. I have never wanted to be a performer and really don’t have plans to ever do live shows or anything like that. I’m much happier at home writing the music and honestly, that’s all that matters to me. As long as I can continue composing and playing piano and having fun, all is well. As far as pianists, anyone who was playing and recording “New Age” music in the 80’s and 90’s, like David Lanz and Philip Aaberg. I was also a big fan of Enya and George Winston. Of course, even though I didn’t enjoy playing the classics, I was certainly inﬂuenced by them – Mozart, Rachmaninoff, Liszt, Schubert, Beethoven. I have always been a huge fan of ﬁlm scores, so have been very inﬂuenced in my composing by great ﬁlm composers like Rachel Portman, Hans Zimmer, Ennio Morricone, Clint Mansell and all the great soundtracks I listen to. Other kinds of music I enjoy these days – pretty much anything folky and/or ethnic. I’m also a big fan of Ambient and Shoegaze type stuff. And, um…a closet Techno/Dance fan. YEAH! First of all, I don’t really play anything other than piano these days and I don’t have an orchestra at my disposal, so Garageband has given me the ability to HEAR all of my ideas for the ﬁrst time. I’m also, um, a bit short on patience and having to actually notate music was always tedious for me and would often deter me from actually composing, but with Garageband I can just create using midi and the pencil tool, which is so much faster and gives immediate results. LOL…I’m such a Gen X’er. I think also, given my total lack of interest in actually performing my music live, the internet offers me the opportunity to get my music out to a very large audience without ever having to leave my house! And online communities like MacJams are just brilliant, giving me the opportunity to meet people who also really enjoy music, offering great resources for feedback and learning, and facilitating awesome partnerships for collaboration and community. Any ﬁnal comments that you would like to add? MacJams and all of the incredible people I have met and continue to meet have just been such an inspiration and blessing in my life. My music has come alive again after many years of silence and I’m just so very excited to be making music and becoming a part of this amazing community. wow. WOW. This is hard. 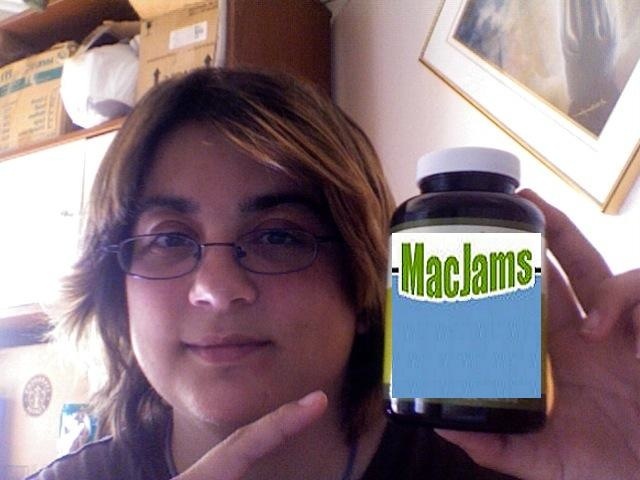 A few of my favorites are futzpucker, Parichayaka, magnatone, MissChaos, rsorensen, Mckenzie, michael2, LunaTrick and drakonis, but there are just so many fabulously talented people on MacJams. I am astounded every time I log in and listen. I seriously haven’t spent a dime at iTunes since discovering MacJams seven months ago. I think your music is a great contribution to MJ ! You’re a great member Shay. Really nice read. for the nice artichle !!! Yay, one of my favorite new(ish) Macjammers! So wonderful to get to learn a little more about yourself and your background! And a new picture of you allows me to return the comment “Awww… you are toooo cute!” Love that jar of blackberry MacJams! And I adore your soulful emotive music… such a romantic you are!